Zolpidem, the active ingredient in prescription sleep aids Ambien, Edluar, and Zolpimist, is apparently leaving some users — especially women — groggy and impaired in the morning. Thus, the FDA is requiring the manufacturers of these drugs to lower the current recommended doses. The concern, says the FDA, is that the levels of zolpidem found lingering in users’ blood the morning after may be enough to impair activities that require alertness, including driving. And the last thing the world needs is sleepy people on the road. 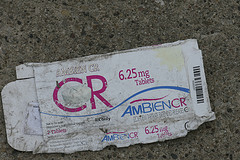 The FDA has found that females eliminate zolpidem from their bodies more slowly than men. Thus, it has notified the manufacturers that the recommended dose should be lowered for women. For men, the FDA is requiring that the drugs’ labeling should recommend that health care professionals consider a lower dose for men. Additionally, the FDA is urging all health care professionals who prescribe drugs containing zolpidem to caution their patients about the risks of next-morning impairment. In terms of specific numbers, the recommended dosage of zolpidem for women is to be lowered from 10 mg to 5 mg for immediate-release products (Ambien, Edluar, and Zolpimist) and from 12.5 mg to 6.25 mg for extended-release products (Ambien CR). As for the labeling of zolpidem subscriptions for men, the FDA says it should recommend that health care professionals consider prescribing these lower doses (5 mg for immediate-release products and 6.25 mg for extended-release products). The drugs affected by the FDA announcement are already available in the lower doses. According to the FDA, people currently taking the higher doses (10 mg or 12.5 mg) of zolpidem-containing insomnia medicines should continue taking the prescribed dose as directed until discussing with their health care professional.